Hollywood. Surfing. Sun-soaked beaches. The Golden Gate Bridge. Half Dome. Disneyland. These are some of the iconic images that immediately come to mind when people think of California. However, bright green fields of hemp might soon replace one or even a few of these symbolic representations of the Golden State. On September 30th, California joined 40 other states that have already defined industrial hemp as “distinct” while removing barriers to its production. Under Senate Bill 1409 signed by Governor Jerry Brown, industrial hemp is no longer defined in the California Uniform Controlled Substances Act as simply a fiber or oilseed crop. The bill, scheduled to take effect on January 1, 2019, allows California farmers to enter the rapidly-growing hemp industry on a wide scale, raising industrial hemp to produce hemp seed, oil, fiber, and extract for a variety of uses. SB 1409 wasn’t the first time California attempted to pass legislation permitting industrial hemp farming. The state was well-positioned to permit this type of farming back in 2013 when Senate Bill 566 was enacted, conditionally approving an industrial hemp pilot program. However, when Proposition 64 passed in 2016, effectively legalizing recreational marijuana use, an unfortunate side effect was the inability to differentiate industrial hemp from its psychoactive counterpart, cannabis. This bill, however, brings California’s hemp laws up-to-date by allowing the pilot program to proceed as originally intended and by changing the definition of industrial hemp to reflect the major differences between it and cannabis. On a federal level, the government has initiated similar efforts to update industrial hemp laws by removing the product from the federal controlled substances list. In the meantime, despite national views seemingly trending in a “legalize all of it” direction, individual states and the federal government are continuing to jockey for authority regarding the related issues surrounding legalizing hemp as well as marijuana. 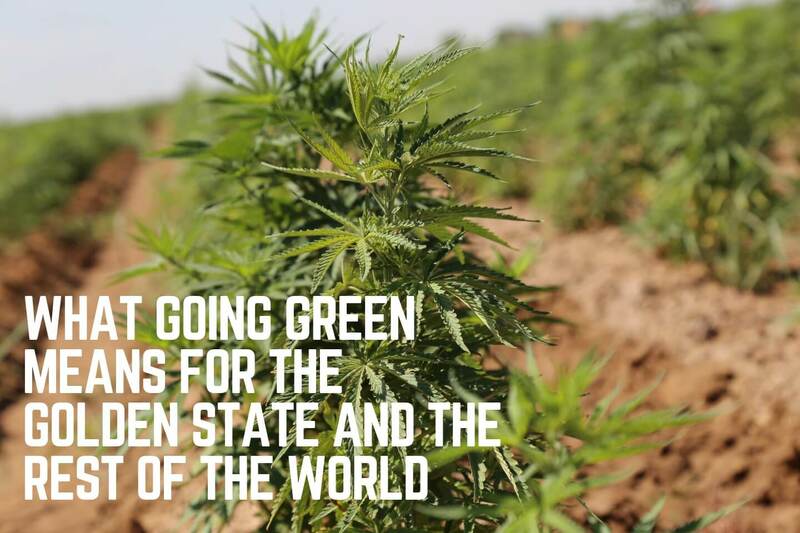 California is a premier location to grow hemp as it has one of the largest agricultural infrastructures in the United States, including some of the most fertile soil in North America. Additionally, cultivating industrial hemp in California makes a lot of sense, particularly because of the state’s arid climate – hemp generally requires less water than other crops and fares better with generous amounts of sunlight – making large portions of California naturally ideal for growth and production. On the subject of water, with the state’s well-documented and ongoing water crisis, crops like hemp could actually help the state conserve more of its precious supply. For example, in the Antelope Valley, where alfalfa currently represents the No. 1 agricultural crop, farmers could save five acre-feet of water per acre when switching from alfalfa to hemp, according to Senator Scott Wilk, the author of SB 1409. Similar conditions in the Imperial Valley of extreme southern California have permitted cultivators like Farmtiva to thrive as the company operates an industrial hemp research and grow facility on 160 acres of a former U.S. Department of Agriculture (USDA) research facility which includes greenhouses and a soil testing laboratory. With increasing opportunities in the industrial hemp industry, valuable partnerships are being forged between forward-thinking companies and organizations who understand that growing industrial hemp may provide invaluable benefits – on a global level. Farmtiva’s recent partnership with Isodiol®, for instance, is one that’s deeply-rooted in advancing a shared mission of building awareness and education while bringing the powerful benefits of cannabidiol (CBD) to people around the world. Congruent to that mission of awareness is the fact that CBD acceptance is rising and so is consumption – especially in the United States. In the U.S. alone, CBD sales are predicted to nearly quadruple over the next four years, from $535 million this year to over $1.9 billion by 2022, according to New Frontier Data, a premier cannabis data analytics firm. With figures like these paired with expert analysis, the prevailing thought is that the up-and-coming hemp and CBD industry will add jobs and stimulate economic growth, eventually providing opportunities to people across the globe. The passage of SB 1409 should be encouraging to proponents of both medicinal and recreational hemp use not only in California, but throughout the rest of the U.S. and eventually the world. For centuries, people have lauded hemp-based products – particularly cannabis – for having many unique uses and providing powerful health benefits. The most common use of these products is for pain. The hemp plant has helped people combat not only pain, but inflammation itself, which typically results in chronic discomfort. Use is becoming more specialized, too, as athletes are increasingly turning to hemp-derived CBD oil to help their muscles recover faster and to overcome common aches and pains due to repetitive injuries and for improved joint health. CBD is also known to be used to help balance the mind while calming nerves. People with anxiety have been aware of the soothing capabilities of hemp-derived CBD for years and many recommend its use. Similarly, many sleepless sufferers claim that such products have allowed them to rest more peacefully as they are able to sleep better and longer. Other common reasons why people take CBD products include boosting immune health, increasing cognitive function, and improving mood, among many others. Perhaps most importantly, clinical research is validating claims of hemp-based treatments while adding credibility that these all-natural remedies work. One of the best examples is a recent study that led to the U.S. Food and Drug Administration’s approval of a CBD-based drug that treats patients with rare forms of epilepsy by reducing seizures. Other independent studies are currently being conducted that address conditions such as autism and cancer. California has officially recognized the numerous benefits of hemp and the opportunities surrounding the industrial farming of it. The approval of SB 1409 should help steer the remaining U.S. states that don’t allow industrial hemp farming toward similar legislation and acceptance. Furthermore, California’s global influence may help propel its importance, ultimately setting an example for the rest of the world to follow. Isodiol® is the global innovator and worldwide leader in the development of CBD-based pharmaceuticals and CBD consumer products. Our mission is to create a cultural movement by building awareness and social acceptance, ultimately empowering people to live better lives – globally. This mission is enacted through Isodiol’s unique divisions and subsidiaries that deliver the powerful benefits of CBD to people around the world. For more information about Isodiol, please visit https://isodiol.com or call (855) 979-6751.